Use 'Somebody' to Send Messages to Friends Via Strangers | OhGizmo! If you think about it, social media takes away from actual socialization because of the lack of in-person interactions. Aiming to inject a little bit of that back into social-centric apps is Somebody. 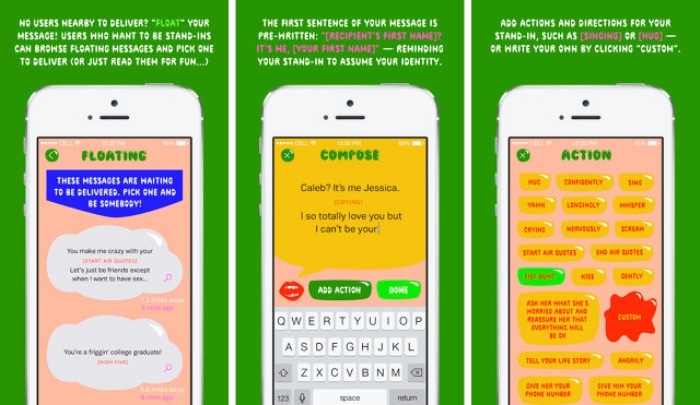 The app literally lets you use somebody (while using Somebody–get it?) to send a personal message to your intended recipient, wherever they may be. Here’s how it works: the user composes his message and includes any special instructions to the messenger, such as extra notes on how to deliver the message or any accompanying actions. He then chooses another user of the app in the vicinity of the recipient to deliver the message. Somebody works best with a critical mass of users in a given area; colleges, workplaces, parties and concerts can become Somebody hotspots simply by designating themselves as one (official hotspots on somebodyapp.com). The most high-tech part of the app is not in the programming, it’s in the users who dare to deliver a message to stranger. In this sense Somebody is a far-reaching public art project, inciting performance and twisting our love of avatars and outsourcing. Somebody was created by artist Miranda July with Miu Miu. It’s available for free on iTunes. That was the most uncomfortable app ad I have ever seen.